There are indeed many sources that speak of sacrifices to Odin. In fact, I would argue that his sacrifices are the most famous, at least among the Norse gods. I will tell you what I know, but do feel free to explore any of the sources that I cite as well. A few things should already sound familiar. Odin has been mentioned, who, in the Hávamál, said that he hung for “nine long nights.” Along the lines of that symbolic number, “nine heads” are offered and these ceremonies occur in “nine-year intervals.” A sacred grove is also referred to, and Odin hung upon a sacred tree. The trees of this grove are all considered sacred because of these sacrifices, which are hung upon these trees. Given the nature of this ritual, there is a connection between it and Odin, who sacrificed himself in a noticeably similar manner. Procopius wrote this during the sixth century, which was near the end of the Migration Period.11 Some may believe that the above passage refers to Tîwaz (later Týr), but it is known that Wodan (later Odin) took the reigns of war from him during this period.12 It was during the time of Tactitus, who wrote during the first and early second centuries that the god of war was still confidently Tîwaz. As a result, I consider this example to be referring to Odin, or at least an ‘older’ version of him, especially given the reference of “hanging him to a tree” when considering sacrificial options. It is generally accepted by scholars that this type of sacrifice was “known to be associated with Wodan from early times,”13 thus giving Odin an old relationship with this ritual; a part of Odin, however small, once demanded and expected this type of sacrifice. The words of Adam of Bremen must also be remembered, for he also mentioned this sort of human sacrifice (that of hanging) and wrote of such just after the end of the Viking Age.15 Thus, we have sources from before and after the Viking Age that indicate that men and animals alike were hung from trees in sacrifice to Odin. His name as “Hanga-god” (Hangaguð), God of the Hanged, comes from this practice. As we have already seen in several written accounts, men are hung upon trees when they are sacrificed to Odin, hence the additional title being added to Odin’s long list of names. Yet, do we have any proof beyond written record that the Norse and other Germanic peoples, whether before, during, or after the Viking Age, sacrificed men in this manner? Is this ritual purely literary exaggeration and symbolism to make these people seem backwards and violent in the eyes of Greeks and Christians alike? The Tollund Man would suggest otherwise. 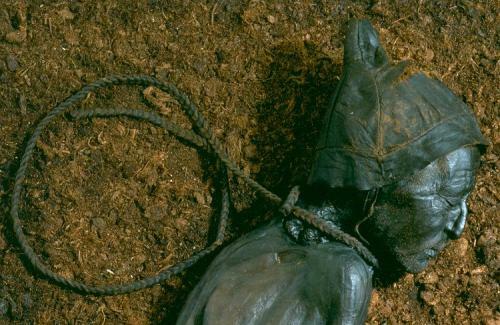 “The Tollund Man with the rope around his neck”, retrieved from http://www.tollundman.dk/haengning.asp. In the end, there is much to be said about Odin and the sacrifices that were made to him, the prevalent theme of which is consumed by spears and the hanging of men from trees; sacred groves, spears, hanging, and the men of war are all associated with Odin and the rituals of sacrifice in his name. Yet, one could also offer him a ritual toast and feast, which was far more ‘peaceful’ than hanging men in trees; sacrifices of this less extreme nature were likely the norm. Although, that still usually involved the sacrifice of animals and the use of their blood, which, it seems, could have been either hanged or slaughtered in order to be sacrificed properly. Apart from the hanging of men, the sacrifices made to Odin were much like that made to other gods, such as Thor, Freyr, and Njord (all mentioned above, at one point or another). Regardless of the available options, though, the spear-pierced man (or animal) hanging upon the branch of a sacred tree was a type of sacrifice ritual specially devoted to Odin, the God of the Hanged. I hope this information satisfies your search for knowledge, friend, for that is what I know in regards to sacrifices to Odin. Feel free to ask me any follow-up questions you may have, or even investigate the sources that I used in the composition of this post. Regardless of what you do now, I wish you the best in all your endeavors. 1. This could be the opposite of what happened, though; the story could have derived from already existing rituals, versus being the cause for its beginning. The poem itself, however, is likely later than the rituals themselves, but that does not mean that the lore behind it was not already alive and well in the hearts of men long before. 2. Some include stanzas 141–144/5, which consists of the knowledge of runes that he acquired while hanging upon Yggdrasil. I have decided to omit them since our purpose is the ritual of the sacrifice itself. 4. His account, History of the Archbishops of Hamburg-Bremen, is from ca. 1072-75/6, and was later revised in the early 1080s. 6. Sagas are always challenging for the scholar, for we must beware the motifs being used for the purpose of symbolism. It is clear here, after all, that the example stands more strongly for the purpose of symbolism, as the passage will soon tell. Regardless of the inherent insecurities that we may have when history meets mythological fantasy, the existence of other sources that attest to human sacrifice makes this example all the more likely. Furthermore, it strengthens the connection of this practice to Odin. 8. Snorri Sturluson, Ynglinga saga, in Heimskringla, Volume I: The Beginnings to Óláfr Tryggvason, translated by Alison Finlay and Anthony Faulkes, 2nd ed. (London: Viking Society for Northern Research, University College London, 2016), 42. The topic of burning the dead is actually a rich discussion to be had itself, although not necessarily in the form of burning men alive in homes, which is a separate fruitful discussion to be had. 9. The source soon to be mentioned was written by Procopius, an outsider writing in the early sixth century. The key problem is not that he was an outsider, but rather the date of the source. Gods change, and this is a very early look at Odin, or rather Wodan. Some actually would consider these gods to be very different from one another. In fact, because gods change over time, does the Odin of Snorri’s Edda truly compare to the Wodan on the sixth century? They are the same, and yet they are different. Odin is clearly considered God of the Hanged in later works (soon to be mentioned in more detail), but not to the intense nature that is seen in even earlier records. Thus, to use an early source to attest to Odin’s thirst for human sacrifice in war raises the question of temporal placement. Did the men of the Viking Age sacrifice war-captives like this? Perhaps not. Other source do suggest, though, that the practice had not quite died out completely. At the very least, it was perhaps not to the same scale as it was in the more distant past. Yet, even that scale is questionable. 10. Procopius, History of the Wars: Book V and VI, translated by H.B. Dewing (Cambridge, MA: Harvard University Press, 2007), Chapter XV. 11. The period, lasting primarily from the second century up to the sixth century, is named for clear reason: many of the Germanic peoples were on the move — mostly moving south into the territories of the Roman Empire. 12. The process is complicated, of course. In fact, it appears likely that Odin is not simply the later version of Wodan, but a combination of both Wodan and Tîwaz (see H.R. Ellis Davidson, Gods and Myths of Northern Europe, 56-7). This returns us to the debate mentioned above in endnote 9, which argues that the Odin of the Viking Age may not be the same god we hear of from before the Viking Age. Debates aside, though, this is still a part of Odin’s overall image. Whether the influence is direct or indirect does not matter, for the fact still stands that a part of him once, or always had, demanded human sacrifice in such a manner. 13. H.R. Ellis Davidson, Gods and Myths of Northern Europe (repr., 1964; London: Penguin Books, 1990), 144. 15. Within a single decade, in fact. The Viking Age ‘officially’ ends in 1066, with King Harald Hardradi’s defeat at Stamford Bridge; Adam of Bremen wrote his text around the year 1075. 16. This information, and much more, was found at http://www.tollundman.dk, which was developed by the Silkeborg Museum and Library, along with ACU Århus County. I thus consider the information to be fairly reliable. 17. Snorri Sturluson, Hákonar saga Góða, in Heimskringla, Volume I: The Beginnings to Óláfr Tryggvason, translated by Alison Finlay and Anthony Faulkes, 2nd ed. (London: Viking Society for Northern Research, University College London, 2016), 98-9.